There couldn’t be a more apt quote to contextualize the cryptocurrency market’s current reversal of fortune. Bonus points for the movie’s Christmas setting, as the market’s recent peak coincided with the Christmas season. Indeed, the holiday season came with a euphoric upswing in market confidence. Crypto-related topics broached Christmas gathering conversations, 2017 Year-in-Reviews looked to crypto’s rise in prominence, and the market hit an all time high capitalization of $830bln on January 7th. And things literally descended. We’re two weeks into 2018, and prices are in a freefall as previously green numbers are bathed in red–a less-than-jolly manifestation of the seasonal color. At the time of writing, crypto’s total market cap sits at $430bln, a 48% loss from its all-time high two weeks ago. Tether excluded, not a single coin in the top 100 is green, and the average 24/hr loss in the top 10 is roughly 30%. So if you were in any doubt that you’re the only one with a bleeding portfolio right now, be comforted–misery loves company, and you’re far from alone. Perhaps we can comfort you further. Corrections like this have happened before. Four times, as a matter of fact, and they’ve all occurred around the same time, right at the onset of the new year. Since 2014, the cryptocurrency market has undergone substantial corrections with the advent of the new year. What’s more, with each successive year, the corrections have been more severe than years past. While the market was making a run up to its all time high, u/trollerroller made a Reddit post to r/cryptocurrency indicating this trend, warning users that it was bound to repeat itself soon after the market’s recent bullrun. Looking at the chart associated with the post, the parallel is uncanny. Moreover, the drop as we entered 2017, a gut-punching 36%, most closely mirrors the trajectory of the current correction at 48%. In the post, u/trollerroller attributes this perennial trend to investors cashing out for tax season. This very well could be a contributing factor, but another analysis suggests additional/alternative explanations. 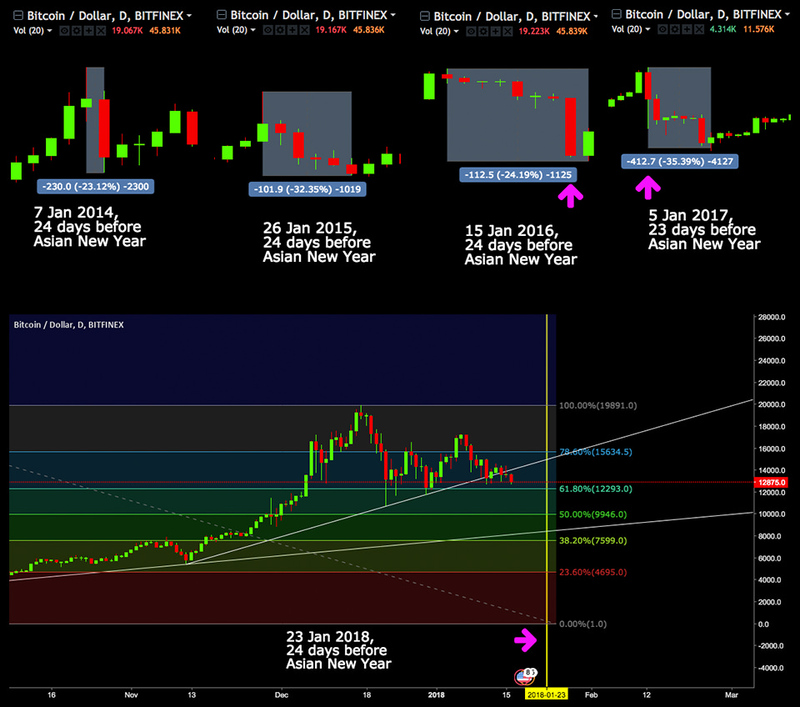 One r/cryptocurrency post correlates these cyclical corrections to the Lunar New Year, also known as the Chinese New Year. According to a post by u/eclipsegum–and an illustrative chart credited to u/Secruoser–the market always tanks nearly three weeks out from the Lunar New Year. The Asian populace, u/eclipsegum argues, withdraws their money from crypto to spend on travelling and gifts, and seeing as Asian markets make up a significant chunk of cryptocurrency’s buying power, this puts a dent in market’s total valuation. Given historic trends, we have little reason to be worried. In fact, to turn the situation on its head, we have cause to be thankful. The market was steadily approaching $900bln at its peak, a nearly three-fold increase from its $300bln valuation coming into December of 2017. This correction is healthy, and it will reset the market to a more stable position that will allow for growth going forward. If you’re new to the fold and bought in over the holiday, this has likely shaken your confidence along with your wallet. I won’t trivialize your situation, as you’re likely significantly down and that’s a huge bummer. But don’t fear, and don’t panic sell. If history continues to repeat itself, things will look up soon, and the market will chug on towards a steady recovery. For instance, if you look at the correction from last year, it’s but a tiny blip on the one year chart, a now-insignificant bump on the road to larger growth. So walk away from your portfolio for a while, buy the dip if you’re feeling bold, and–yes, that’s right–hodl on tight. Crypto’s got some fight in it left, and there will be more revelries and zeniths to come.